Tired of the dried out turkey and same old side dishes? Forget the stress of preparing Thanksgiving dinner in a day. This year, celebrate the holiday with a French twist. I was inspired to create this elegant holiday menu while traveling through the South of France with my family. The inspiration came not only from the incredible food and wine to be had in this region, but also from the culture and life style of the people in the French countryside. If you have a passion for cooking and a love of entertaining, this do-ahead menu is for you. You will get the best of both worlds: a day in the kitchen doing one of the things you love most – cooking – without stress or pressure, and the next day with the people you love while enjoying the meal you have prepared. I recommend serving a bold red wine from the Bandol region of France with this meal. If not available, a red Ctes de Provence or California Pinot Noir may be substituted. Bandol is considered the premier wine-producing region in the South of France. It is located in southwest Provence, starting on the Mediterranean and running several miles from the coastline to the mountains. The red wines made in Bandol are bold, earthy, rich and complex. It is the perfect medium for braising a Provencal holiday favorite sanglier (wild boar). 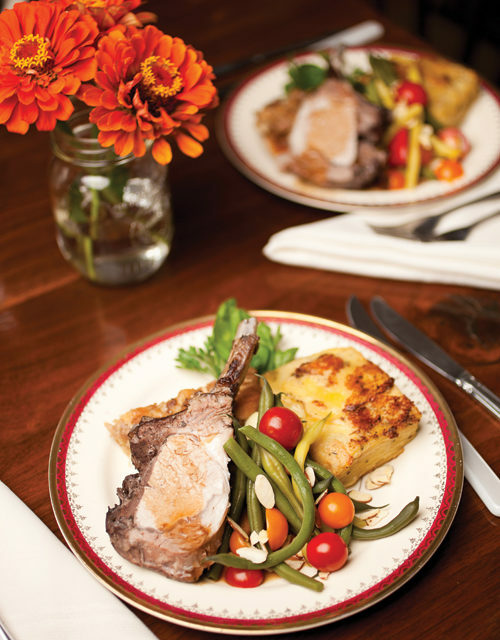 In this recipe, I have substituted a crown roast of pork for wild boar. If a Bandol wine is not available, you can substitute a Ctes de Provence red. Preheat oven to 350¡. Season pork with salt and pepper. Place pork on a sheet pan and brown in oven 30 minutes. Remove pork from oven and place in a stock pot. Pour wine and stock over pork to cover meat (add water if not completely covered by liquid). Cover stock pot with foil or tight fitting lid, lower oven to 200¡ and braise until instant read thermometer reads 135¡ (about 1 ? to 2 hours). After pork is cooked, bring to room temperature. At this point, the meat can be stored refrigerated in the braising liquid for up to two days. Remove pork from liquid and let it come to room temperature (about 4 hours). Preheat oven to 350¡, place pork on sheet pan and cook roast to internal temperature of 145¡ (about 1 hour). Let rest 15 minutes before carving and serving. If desired, strain braising liquid and reduce by half, season to taste. This is your wine gravy. *Ready-made crown roast of pork from locally grown pigs is available at Wagner’s Meats in Mt. Airy. Call 301-829-0500 to place your order. **Herbs de Provence is an assortment of dried herbs consisting of basil, fennel, lavender, marjoram, rosemary, sage, summer savory, and thyme. It is the most commonly used spice blend in Southern France. Pave means pavement in French. These creamy potatoes, when cut into squares and browned, resemble the cobble stoned streets found throughout the villages of Provence. Preparation: Preheat oven to 350¡. Mix all dry ingredients to create seasoning mixture. Wash potatoes (peel if you wish) and slice as thin as possible. Spray a 2-inch deep 9×13 baking pan with nonstick spray. Line the pan with wax paper, spray again with nonstick spray. Slightly overlap one layer of potatoes on the bottom of the pan. Sprinkle potatoes with some of the seasonings and cheese. Coat the potatoes with about ? cup of heavy cream. Keep layering the potatoes and seasoning with spices and coating with heavy cream until the potatoes come almost to the top of the pan. Sprinkle the last layer with the seasoning and coat with heavy cream. Note: Depending upon the thickness of the potato slices, you may not need to use all of the heavy cream. Cover with foil and bake in oven for 1? hours. Remove pan from the oven and let ingredients come to room temperature. Refrigerate overnight. Remove from the refrigerator and turn out potatoes onto a cutting board. Trim the sides neatly and cut into 3” squares. Place the pavs on a nonstick sheet pan. The paves can be wrapped and refrigerated for up to 2 days. Serving: Cook in a 350¡ oven for 45 minutes to 1 hour. Oysters are served virtually year around in the Cte d’Azur region of the French Riviera. When combined with a garlicky sausage from the local charcuterie (butcher shop) and fresh seasonal fruit, you will have a winning combination for any festive occasion. Preparation: Put bread stuffing in a large bowl. Saut onions and garlic in 4 Tbsp. butter over medium heat about 5 minutes. Add wine and cook 5 more minutes. Add mixture to bowl of bread stuffing. Brown sausage over medium heat 15-20 minutes, drain and add to bread mixture. Drain oysters and rough chop, saut in a tbsp. of butter about 2-3 minutes. Add to bread mixture. Saut apples in 4 tbsp. of butter approx. 10 minutes. Add cinnamon, and cook 2 minutes longer. Add to bread mixture. Add chicken stock to bread mixture and mix thoroughly. Serving: Butter a 2-inch deep 9×13” baking pan and add dressing (this can be refrigerated one day ahead) and bake in a 350¡oven for 1 hour. These string beans are a refreshing and lustrious departure from the flavorless green bean casserole that we have become accustomed to during the holiday season. Preparation: In a large stock pot bring 3-4 quarts of water to a boil. Add 3 Tbs. of salt. Add string beans. Blanch for 10 minutes. Drain beans in a colander and run under cold water 3-4 minutes (beans can be kept in a storage bag for a day in the fridge if not being used immediately). Serving: Saut shallots and garlic in olive oil in a large skillet over medium-low heat for 10 minutes. Add tomatoes and cook 10 minutes more. Add beans and toss in skillet. Cover and cook 10 more minutes. Season to taste, add butter and serve immediately. This tart is the perfect ending to a holiday meal in the style of the French Riviera countryside. It is a silky and slightly sweet goat cheese tart garnished with caramelized pears. A Muscat de Frontignon (a sweet and spicy fortified wine from the coastal Mediterranean village of Frontignon) is a great pairing for this dessert. Preparation: Roll out pie crust to fit a 12-inch pie or tart pan. Spray pan with non-stick spray and line with pie crust. Refrigerate crust until ready to use. Preheat oven to 350¡. Bring goat cheese to room temperature. Place cheese in a mixing bowl and beat until smooth. Add sugar, lemon juice, and vanilla extract, continuing to mix. Add eggs, one at a time and mix until fully incorporated. Add cheese mixture to pie crust and spread evenly. Bake in oven 30-45 minutes until cheese mixture is firm to touch. Cool to room temperature. Serving: Saut pear slices in a little butter in a skillet over medium heat for 2 minutes on each side and sprinkle with a little sugar.Garnish tart with pear slices and serve (The tart can be prepared a day before serving.) This meal will serve 10-12 people. Gregory Hutsell is a graduate of the total immersion school of food preparation. A fourth generation native of Carroll County, he grew up watching his grandmother cook for workers at the family’s dairy farm in Mt Airy. and started cooking on his own during his days at Westminster High School. His grandmother was inspirational, as was his mother, who could make something out of nothing using fresh ingredients from the garden. Greg’s brother, Jeff, is currently a chef at Carroll Lutheran Village. At the age of 30, having accumulated a sizable library of cookbooks (he now has 500), Hutsell decided to devote his life to cooking. In 1998 he began working part-time at Maggie’s in Westminster. Three years later, he started working part time in the kitchen at Antrim 1844 in Taneytown. The two restaurant stints were like an apprenticeship, he said. But he did not want the restaurant life. By the time he was 44, he had attained considerable skill at the stove and felt more comfortable being self-employed, catering “in home” wine dinners and banquets. Currently, he teaches at his cooking school, Cuisine Classe, at John Street Quarters, and at Carroll Community College. By the end of May 2010, Hutsell had saved up enough money to spend two and a half weeks in the south of France. He locked up his home in Westminster, rented a house in Provence and took his wife, Penny, and two daughters, Sarah, 6, and Savannah, 10, on a gastronomic tour of the Bandol region, on the Mediterranean near Toulon. It was total immersion. Hutsell bought the freshest food in the local markets and cooked, cooked, cooked, visiting 18 wineries, eating in 20 restaurants, writing down the recipes he developed and accumulating enough information for his own cookbook, tentatively entitled, An American Redneck Cooks in France (At this writing, he is looking for a publisher). The accompanying menu is the result of his experience in Provence. If you have any questions about the recipes or want to contact Gregory, he can be reached at pghutsell@aol.com.